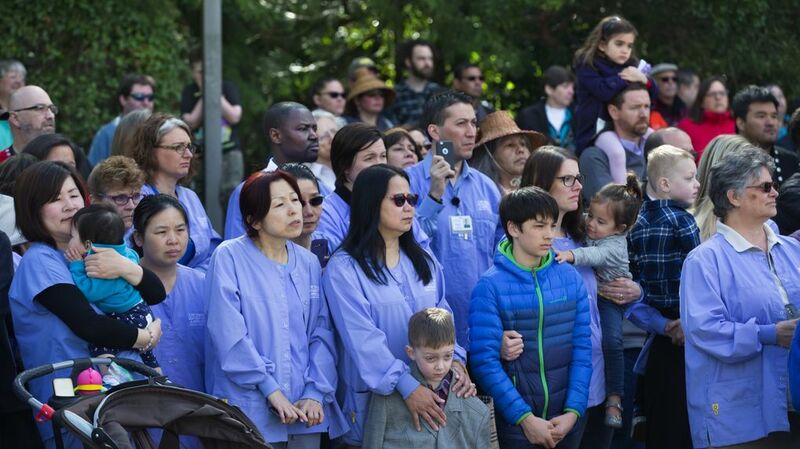 Before she died, Cindy James suggested Northwest Hospital should replace its old totem pole. So David Boxley crafted one to tell the inspiring stories of James, other cancer patients and their caretakers. 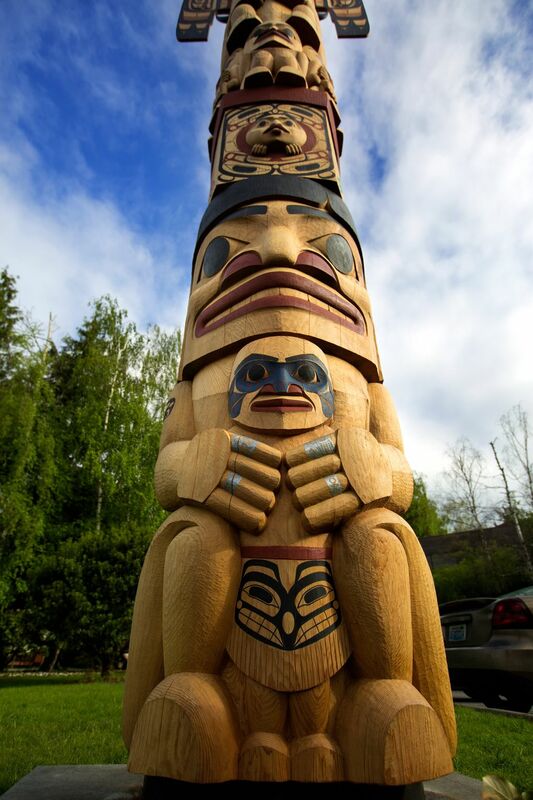 MOST PEOPLE KNOW that totem poles, the signature artwork of Northwest coastal tribes, use imagery to tell stories. 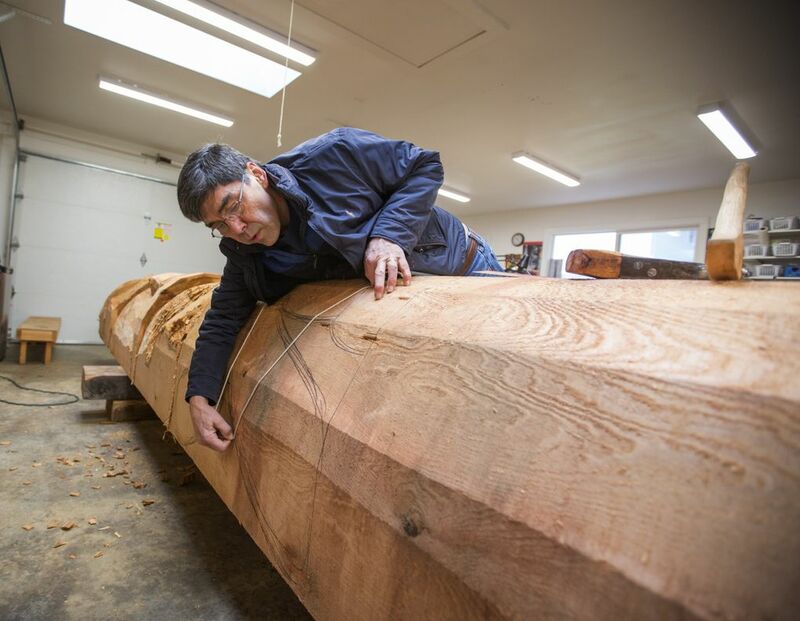 But few among us can grasp the story’s meaning, feel the deep inspiration of the carver — or even know where to start reading the tale. 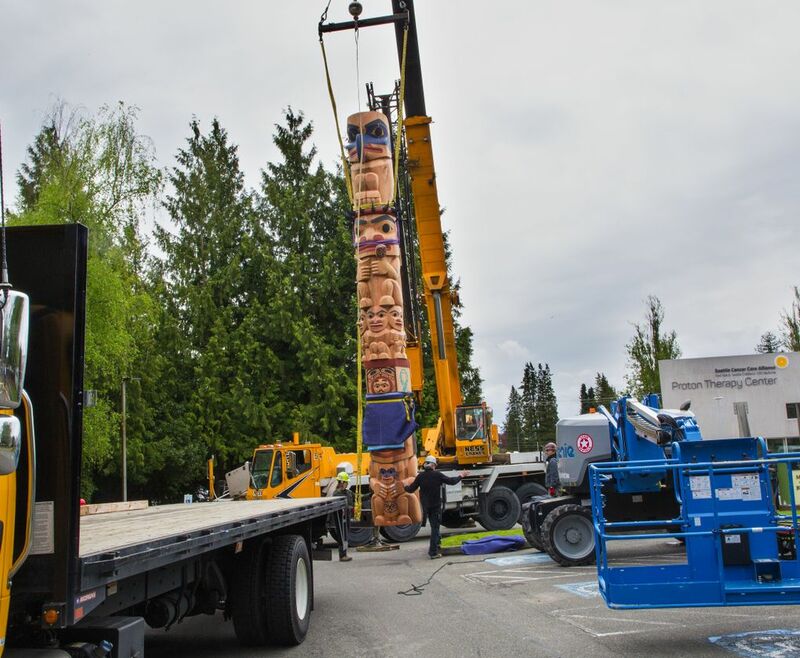 Case in point: Tsimshian carver David Boxley’s latest vertical masterpiece, a majestic, 27-foot totem raised this spring at the entrance to Northwest Hospital in the Northgate area to honor the life of his recently departed sister-in-law, Cindy Sue James — and the loving care afforded to her there by hospital staff during her final days. 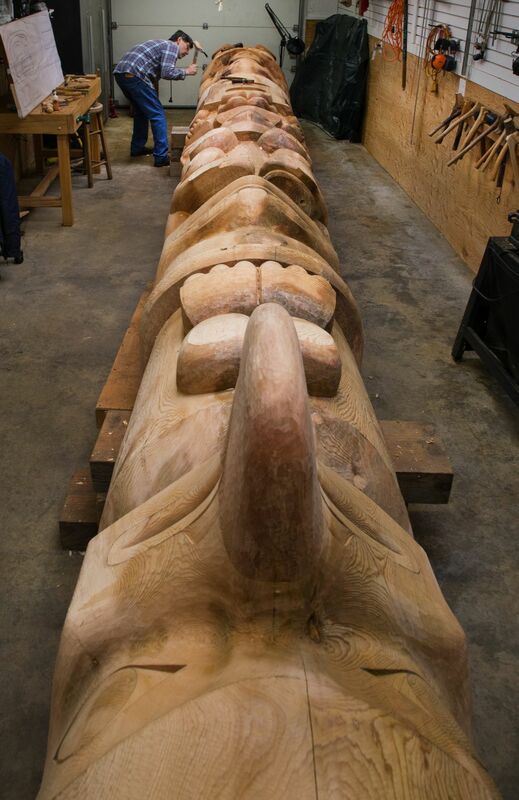 It’s logical to assume that the figure at the pole’s apex — in this case, a broad-winged eagle, representing the eagle clan of the Tsimshian people of Southeast Alaska — is the primary inspiration behind the painstaking work to convert an old-growth log to a work of art. It’s true to an extent; James died from uterine cancer, and the pole is a tribute to her bravery. 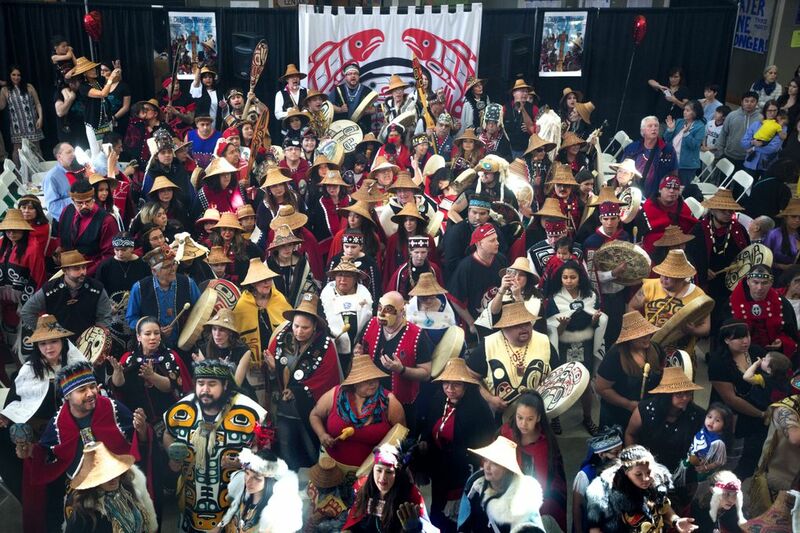 But Northwest coastal tribal tradition is more nuanced. 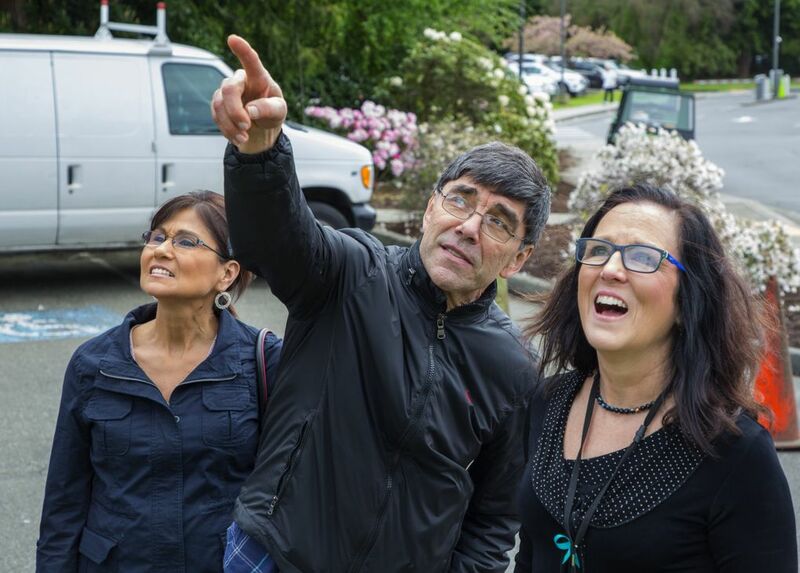 Before speaking at the ceremonial dedication of the pole, dubbed “Eagle’s Spirit,” in early May, Debora Juarez, a Puyallup native, current Seattle City Council member and member of the Blackfeet Tribe, contacted Puget Sound tribal leaders to collect their impressions of Boxley’s design. 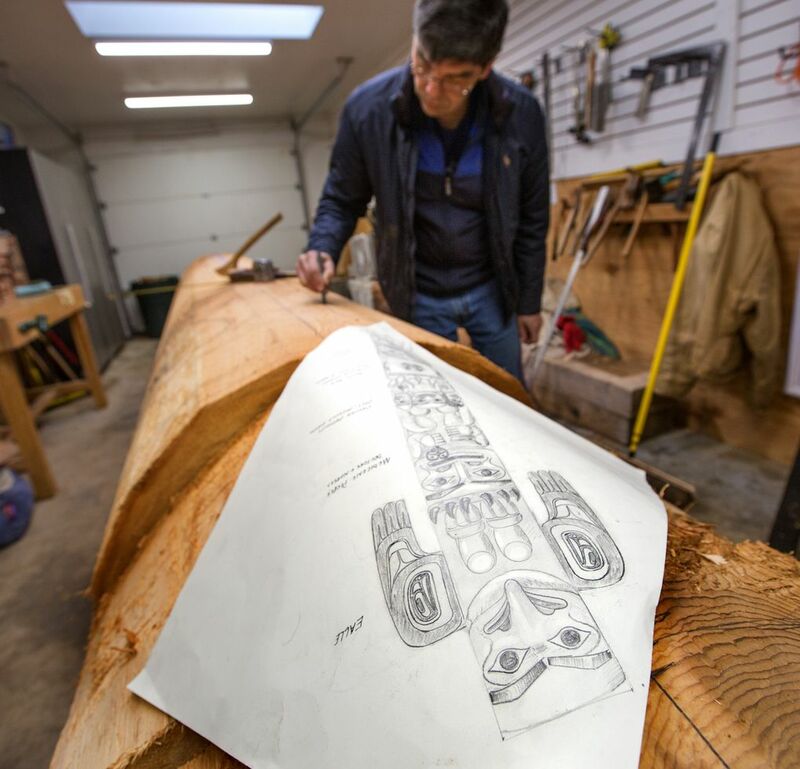 One of them, Swinomish Tribal Chairman Brian Cladoosby, told her that understanding the pole’s iconography required turning nonnative cultural norms upside-down. 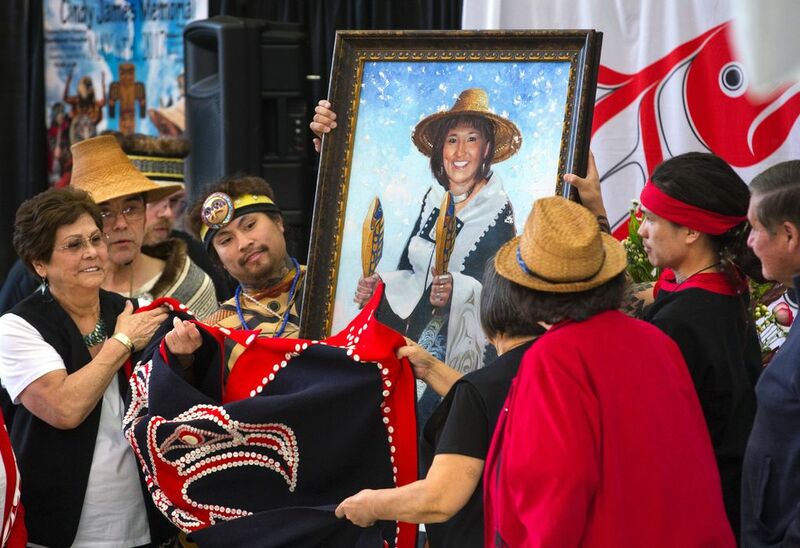 “Leaders, women, are always at the bottom of a totem pole — holding the people up,” Cladoosby told her. 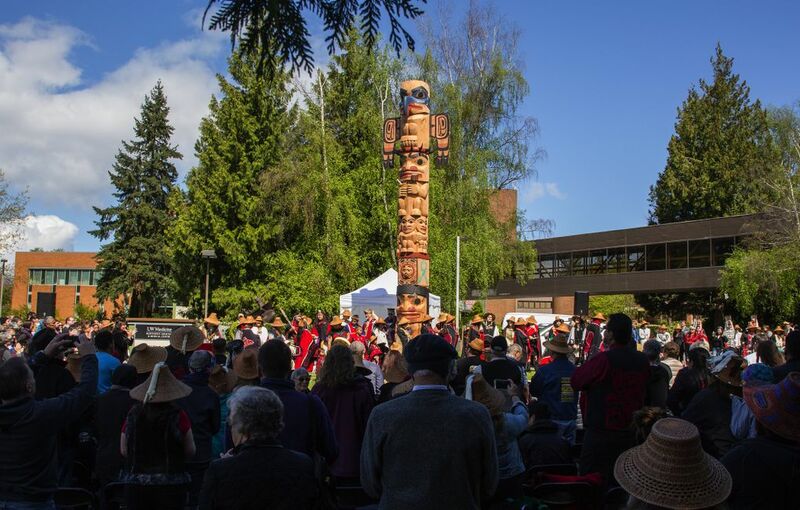 Other tribal leaders echoed the sentiment, noting that the Eurocentric interpretation of someone “at the bottom of the totem pole” carries a derogatory meaning. Not so in the minds of carvers, past or present. 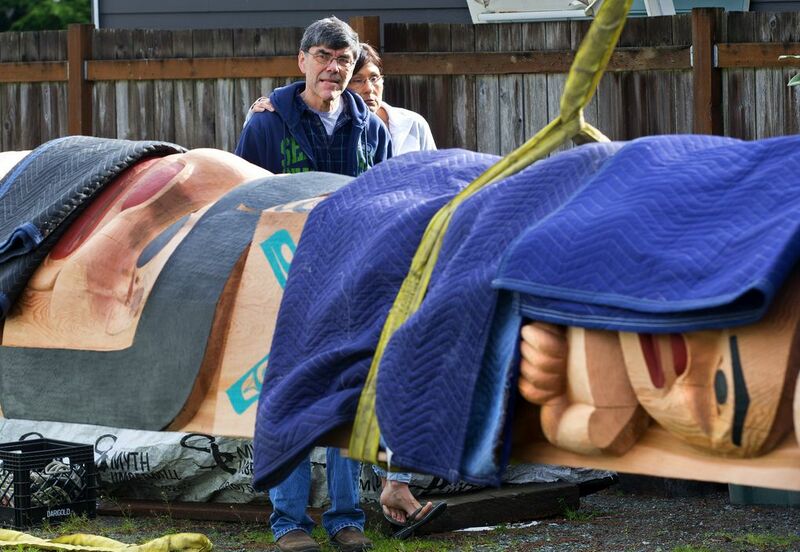 Boxley, one of the most active and honored totem pole-carvers alive, said he placed his sister-in-law exactly where she belonged: as a literal foundation for her family and people. This is why “Eagle’s Spirit” is anchored to Mother Earth by a representation of James. The “signature dimples” on the carved figurine give a hint of her effervescence to visitors and patients at the hospital that James believed deserved honor for its treatment of the suffering and the disabled — particularly those struck by cancer. 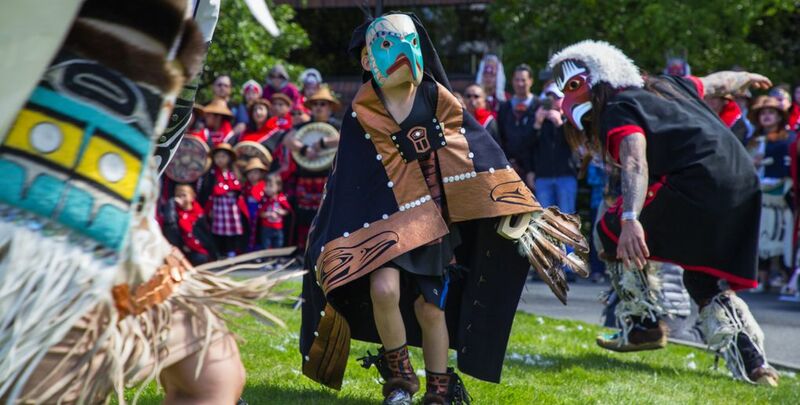 Boxley placed his relative — a longtime dear friend, fellow tribal dancer and enthusiastic warrior in the battle to preserve the threatened north coast tribal culture of the Tsimshian, Haida and Tlingit — at the pole’s base because she was a bedrock for her people. BOXLEY’S MEDIUM IS the Western red cedar, the cloud-scraping green sentinel tree that housed and clothed his ancestors, and still provides what many consider spiritual solitude to those lucky enough to enter the ethereal, mossy domains of the last stands of the coastal giants from Oregon to Southeast Alaska. 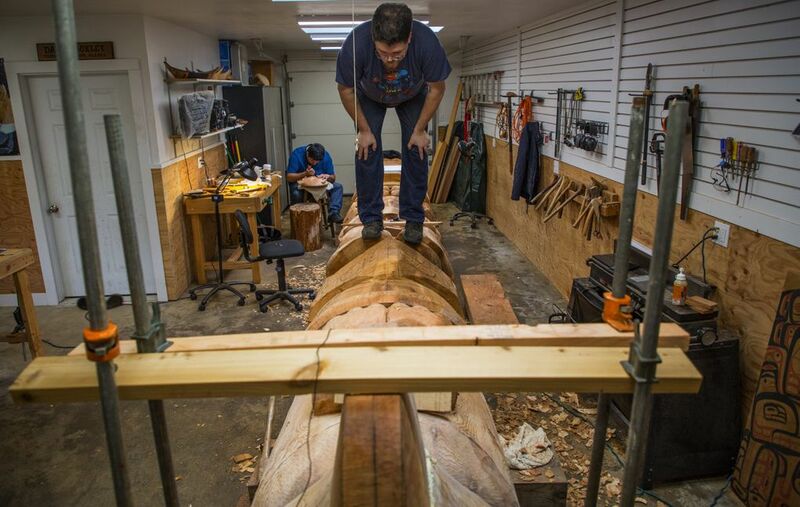 When the tree’s flesh — a fragrant, fibrous wood with the hue of a sockeye and legendary weatherproof longevity — is cut, pushed, prodded, willed and shaped over many months into a totem, the resulting pole will keep telling its story for centuries. James deserved all of that, Boxley says. 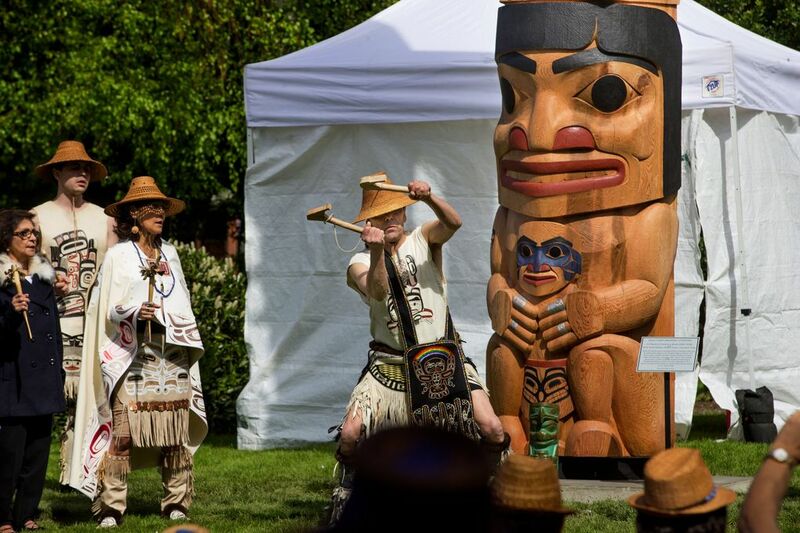 But the totem is unique in that it sprung from her own imagination — a spark of creative light during her darkest hours intended to bring meaning to the suffering endured by cancer victims and their families. 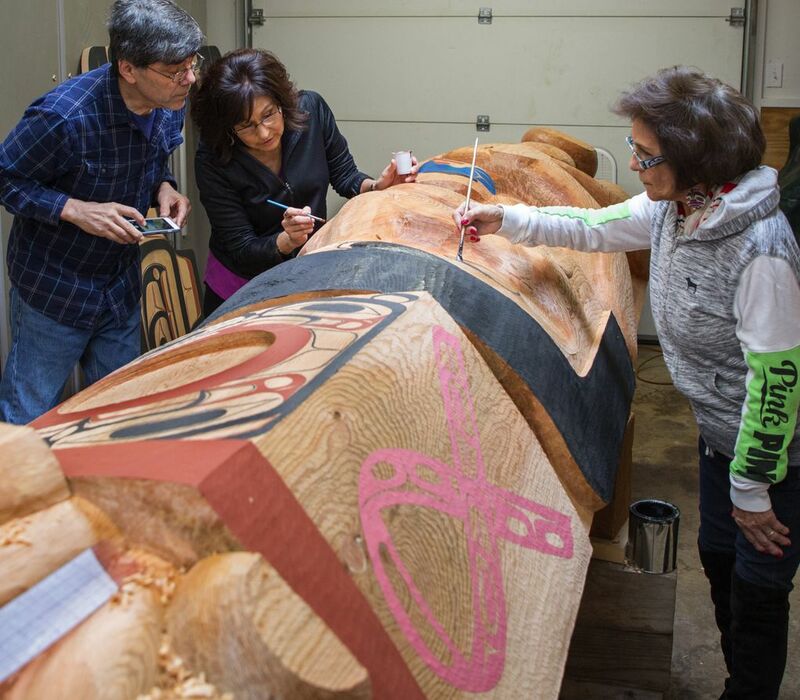 In countless visits to the hospital following her first cancer diagnosis, James and her sister Michelle — or other members of a family that seemed constantly by her side — passed by an aging totem pole that has stood for four decades at the old entrance to Northwest, part of UW Medicine. 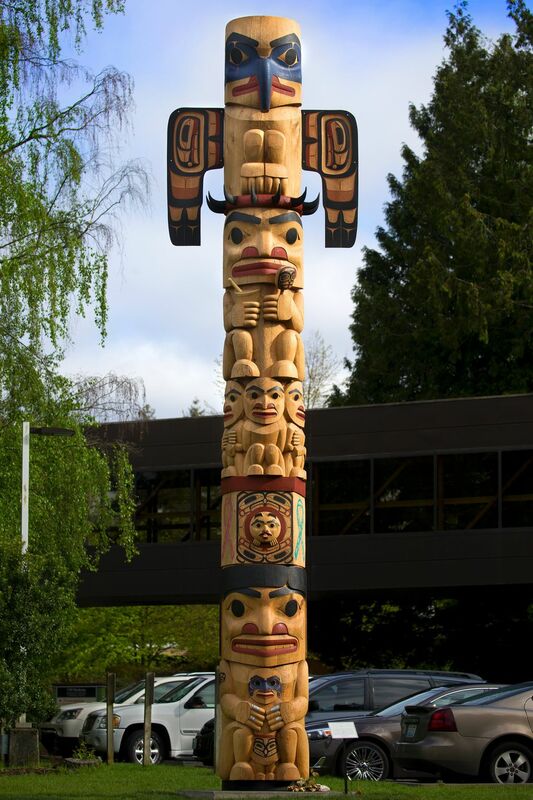 The pole combines tribal tradition with modern symbolism related to suffering, curing and healing. To Boxley, steeped in the often-painful modern history of his people, particularly the devastating epidemics after European contact, it is a fitting blend. 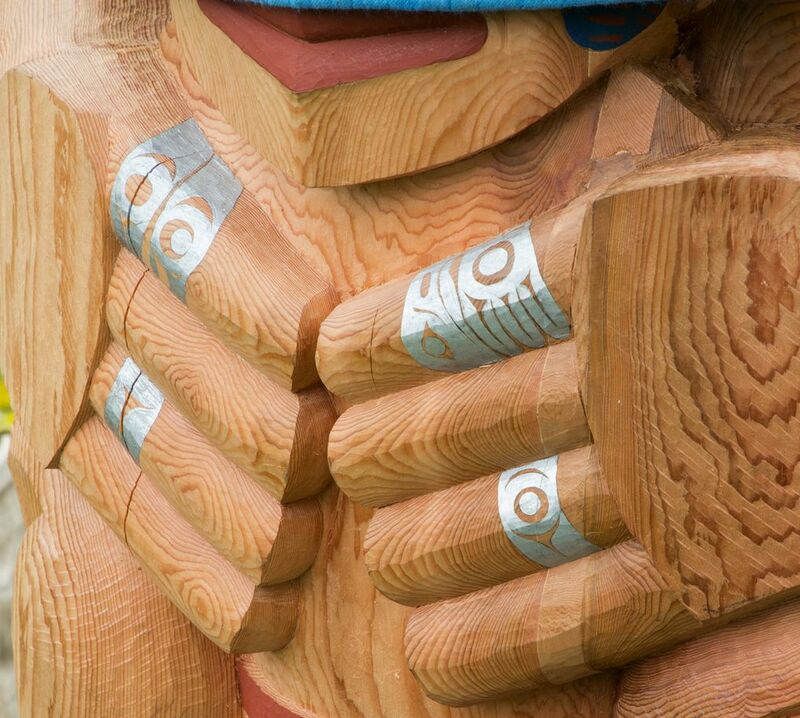 The pole’s top figure represents the family’s clan, the Eagle, or Laxskiik, of the Tsimshian Nation. 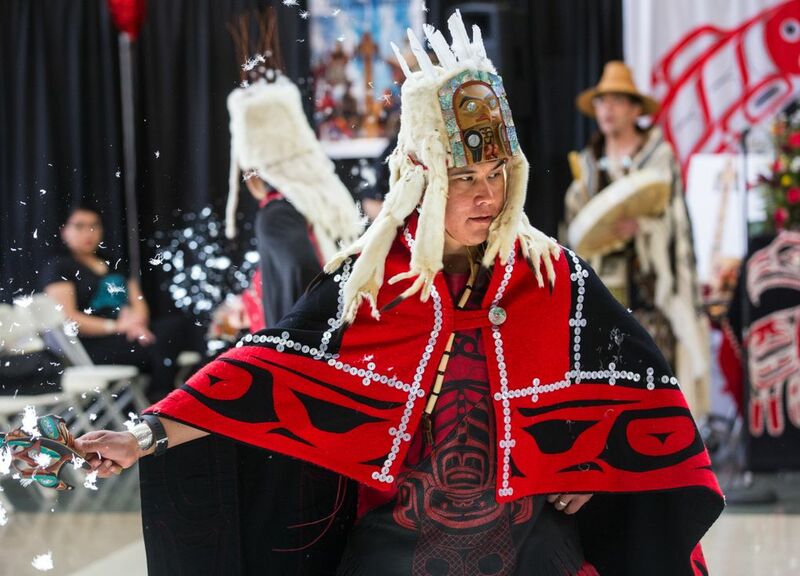 The next figure down, a shaman wearing a colorful bear-claw headdress and holding a rattle and mortar and pestle, represents doctors and caregivers battling cancer — and giving comfort to those who, like James, prove incurable. The center figures on the pole represent past, present and future cancer patients. On either side of the bentwood box upon which they sit are memorial ribbons honoring victims of cancer. From the center peeks a diminutive figure — “Mouse Woman,” James’ identity in her many years of tribal dancing with Boxley’s Git-Hoan Dance group, which has traveled the world to celebrate tribal culture. 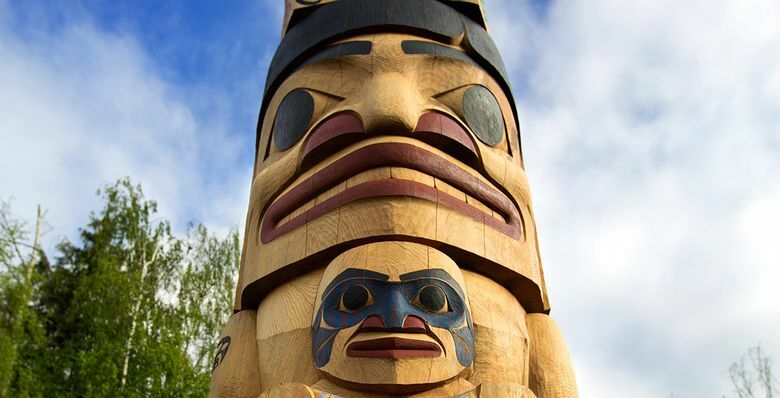 At the base of the pole is James herself, holding her grandson, her face and features carved by Boxley’s son, David Robert, also a skilled tribal artist. It is, in totem pole terms, a remarkable likeness, Boxley says. 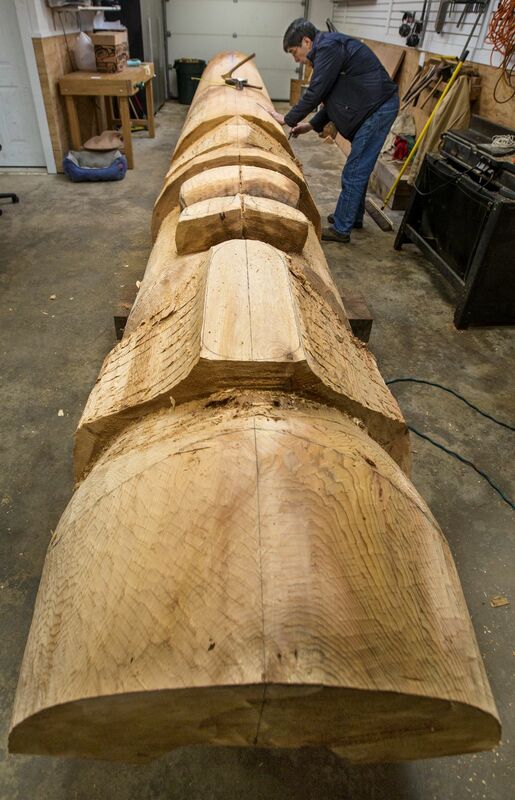 The next phase is removal, with hand tools, of fibrous wood, to form the pole’s general features. 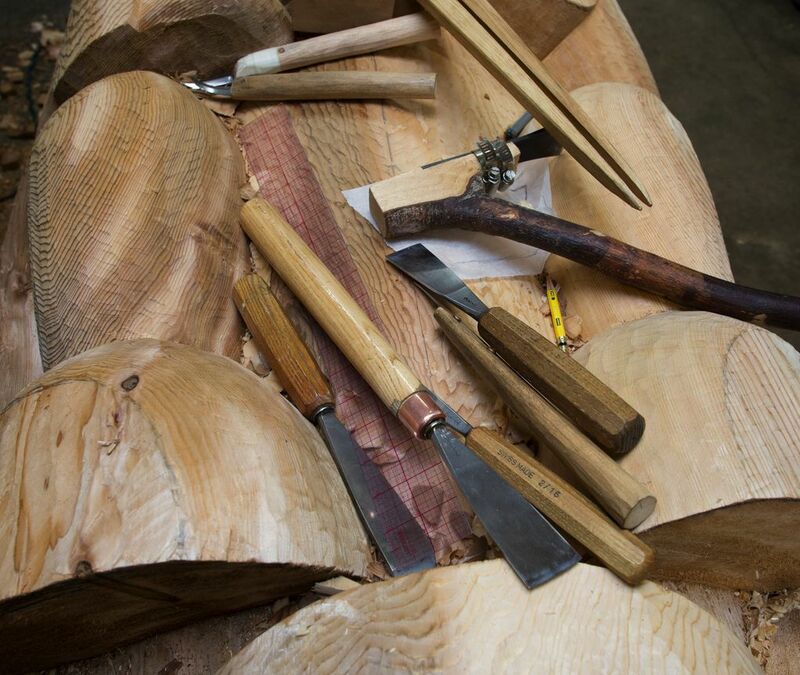 Boxley uses a handcrafted adze, designed with the aid of his grandfather. The handle is the crook of an alder-tree branch, the blade a piece of the suspension of a decrepit Volkswagen bug. “I stood in a car junkyard up on our island in Alaska, and hacked this off a leaf spring,” he says, pausing as he hacks chunks off the log with the tool, sending wood pieces flying across the garage with each deft swipe. The thick knocking of his adze sounds like a freakishly powerful pileated woodpecker doing its work on a rotting tree in a quiet forest. Boxley is 65 years old. 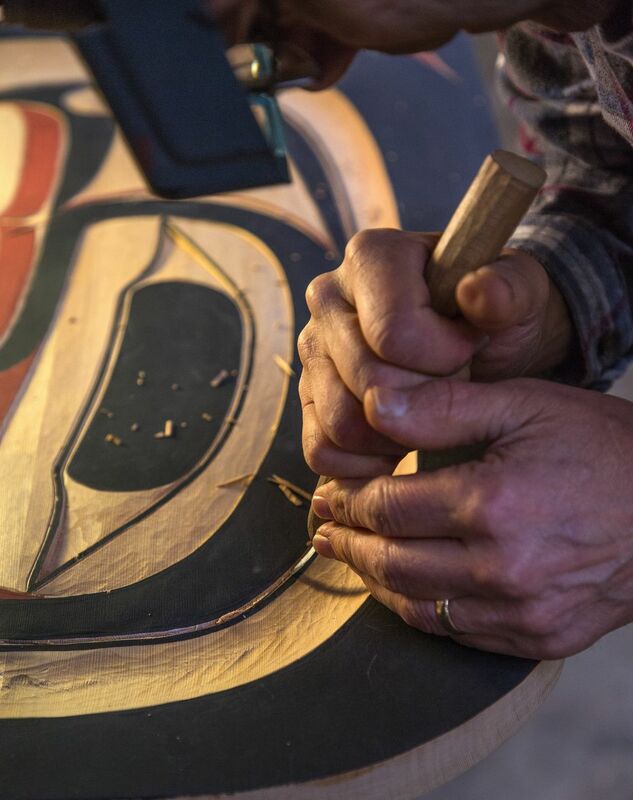 Growing up in his village, Metlakatla, a 15-minute plane ride or hourlong boat trek south of Ketchikan, and in his later life in the Seattle area, which included art studies at Seattle Pacific University, Boxley dabbled in traditional art in various forms. 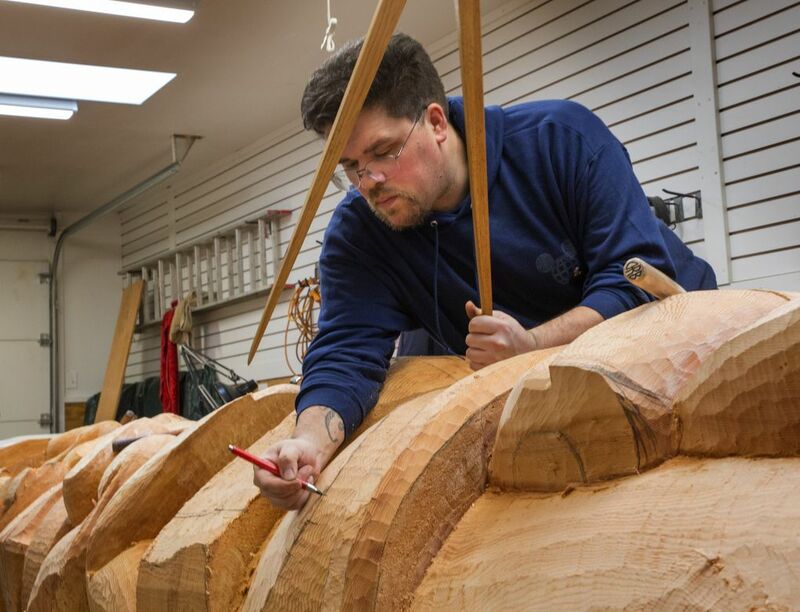 In the early 1980s, when he was in his early 30s, Boxley gravitated toward full-time pole-carving, and eventually became recognized as an elite carver. Gaining that status was no simple thing. Like many tribal people, Boxley’s family lineage is scarred by decades of cultural suppression, much of it forced by European settlers, including missionaries who punished tribal members for speaking their native language or engaging in tribal customs. 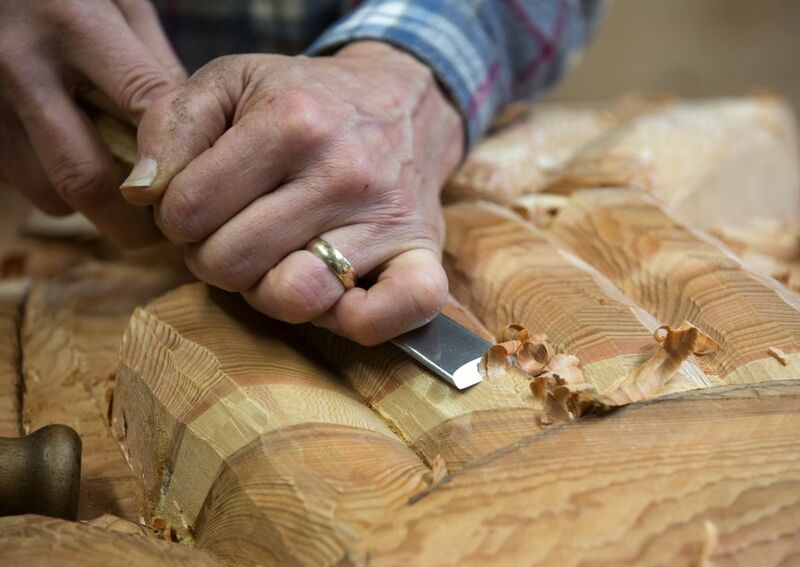 Traditional skills such as carving, honed over millennia, fell by the wayside. But Boxley found plenty of examples of his forebears’ work in museums, galleries and heritage sites. He studied their work and reverse-engineered, in a sense, their craft, right down to the handmade tools and carving strokes. 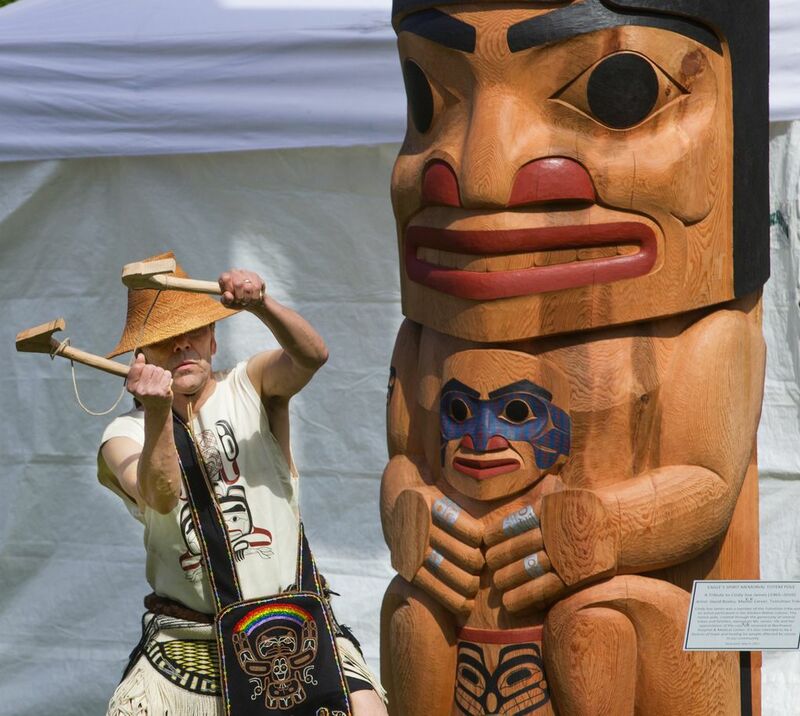 His own artwork, whether carvings or songs and dances he writes and performs at potlatches (traditional gatherings he helped revive for his clan in the 1990s), combines modern means and sensibilities with that ancient acquired skill. Hoping to avoid the disconnect in his people’s recent past, he has already passed, by example, much of what he knows to David Robert. The younger Boxley carved many of the features on the pole. Other family members, including James’ sister Michelle and mother, Carol, applied paint and other touches. Throughout its early life as a totem, the hulking cedar in Boxley’s garage was darkened by many a falling tear. “Not everyone can afford a totem pole,” he says. Because of the cost, Boxley finds himself engaged as a consultant on maintaining or repairing older poles that have rotted or fallen into disrepair. 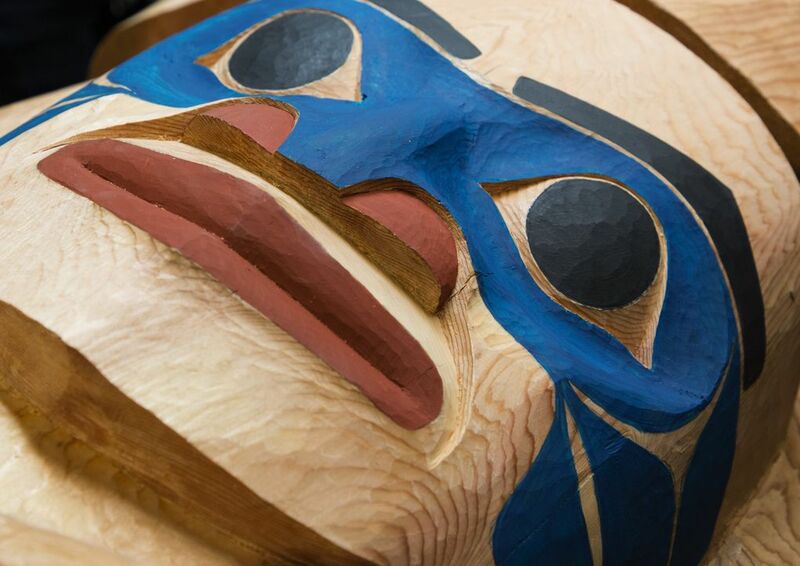 Traditional indigenous art form, meet Thompson’s WaterSeal. Boxley did a consultation on the old pole at Northwest Hospital, concluding it was held together largely by coats of paint, and probably couldn’t be saved. The hospital now plans to remove it. As an active carver in his prime, with his work in demand, Boxley rarely finds himself without a commission. “I’ve probably carved more poles than almost anyone alive,” he says, without a hint of boasting. It is his life, yet just one part of his mission that reaches far beyond simple wood chips on his garage floor. Like many other native artists, Boxley, through his work, hopes to send forth noticeable ripples against the tide of cultural destruction endured by his people. Every pole, artistic mask, song or dance, wall hanging or other work of art he produces serves as a small thread of a rope that, with a bit of luck, might hold his kin together. 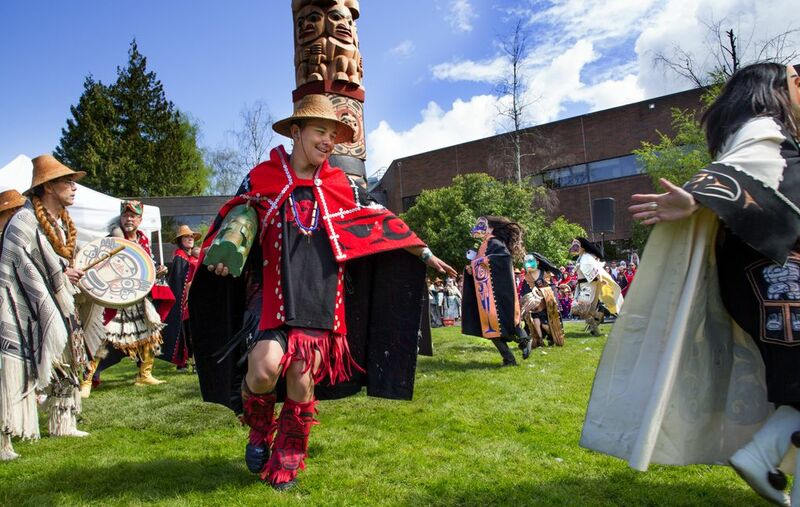 The totem pole that honors his sister-in-law will stand as a proud reminder, he says, not just to her, but to what she represented: James, through her dancing and songs, was a kindred spirit in that quest. Key to that effort is the passing on of the tribe’s language, which Boxley says is threatened with extinction, with only about four dozen active speakers, mostly elders. 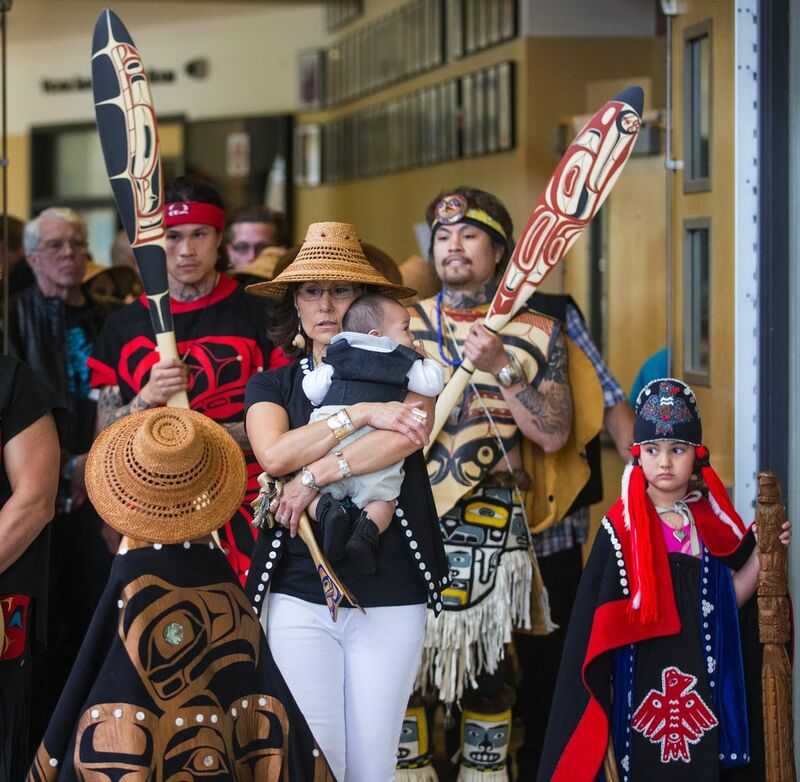 He beams when describing ways that David Robert, living in Metlakatla, has taken up the fight. Thus, to Boxley, the spring dedication ceremony for James’ pole, on an unusually sunny Saturday morning, took on significance far beyond the pole itself. 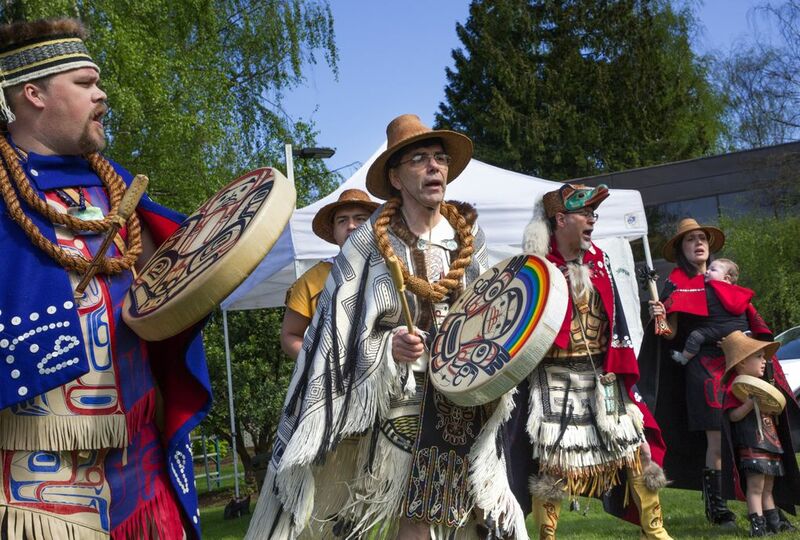 Arriving to participate in that pole-raising were native coastal people from Washington to Alaska, each group singing and dancing to welcome the pole to its new home on the hospital grounds — and to bear witness to the suffering and courage it represents. During the ceremony, tears were shed, laughs unleashed and family traditions honored. 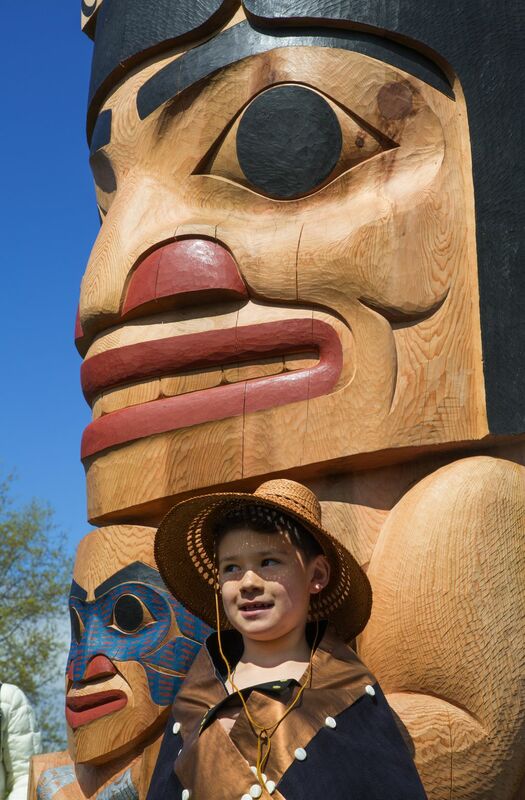 In one ceremonial dance at the pole’s base, the lead part of Eagle was played by James’ grandson Dominic, depicted on the pole standing just feet away. 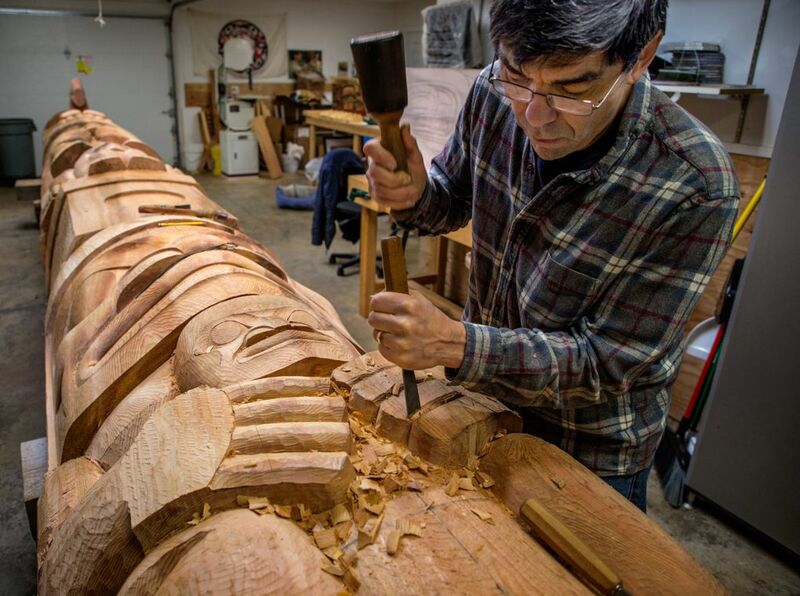 On many occasions that day, as Boxley presided over a potlatch at Ballard High School attended by hundreds, the master carver beamed pride only marginally connected to “Eagle’s Spirit” itself. 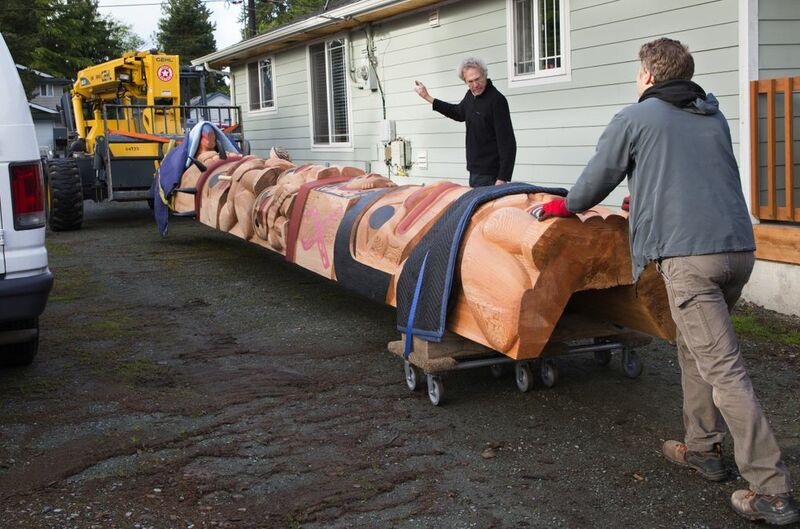 By then, a few miles away, at Northwest Hospital, Boxley totem Number 77 had been handed forward. James’ oncologist, Dr. Katherine McGonigle, called it a “truly inspirational gift” that will inspire staff and patients who pass by every day. 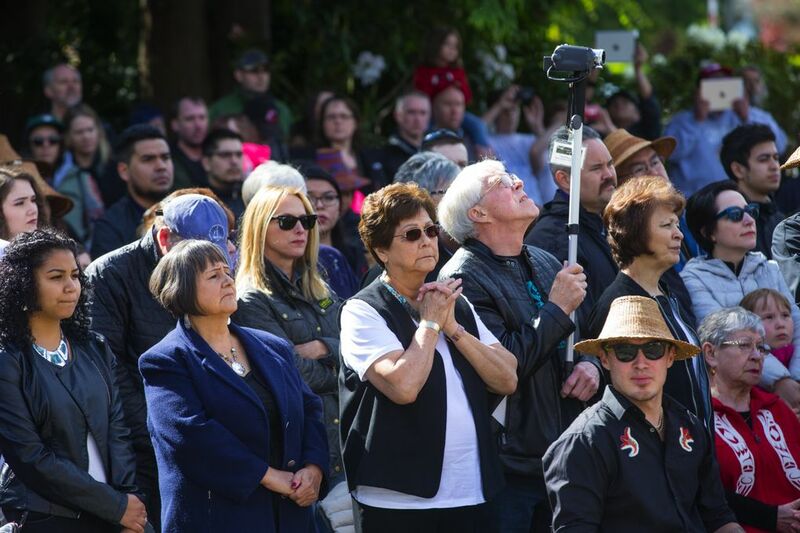 As seats placed for the dedication were cleared away, the repurposed red cedar stood in its reborn state: tall, proud and alone, a graceful lasting monument to a woman’s spirit, a people’s resolve and the gift of an artist touched by both. Ron Judd is a Pacific NW magazine staff writer. Reach him at rjudd@seattletimes.com or 206-464-8280. On Twitter: @roncjudd. Mike Siegel is a Seattle Times staff photographer.